I love to use Swarovski crystals, basically. My family inspires me all the time. 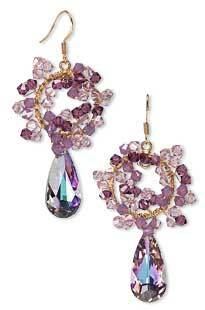 Swarovski crystals and gold-filled findings. About two years ago, I started making earrings for my mom and sister. Yes, I play five different musical instruments. Jewelry-making is a hobby for me, but I enjoy it very much. Whatever you imagine you can bring to life. View all of Gabriela's designs in the Gallery of Designs.